The Gifted 2.5: “afterMath” Review – Eggplante! 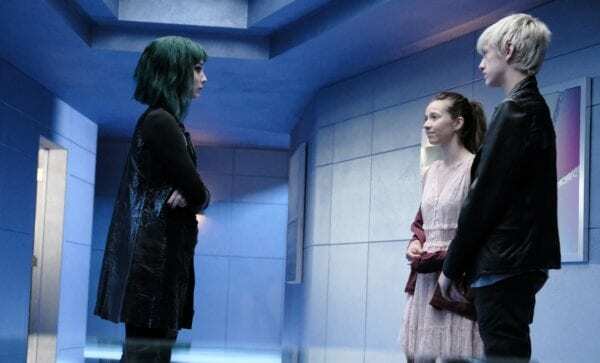 The Gifted’s previous episode was certainly an exciting one, beginning a new phase in the ever-escalating battle between humans and mutants. “afterMath”, true to its name, primarily dealt with the immediate political and social fallout from the mutant mental hospital breakout, as the Inner Circle desperately tries to win over the patient they came for, while the Mutant Underground quickly becomes overwhelmed with the prospect of trying to save so many confused, unstable mutants. This mostly led to an episode that was full of tough choices and strong character, even with the action once again taking a back seat to the drama this week. One of the biggest teases before the previous two-week break between episodes of The Gifted was who exactly the Inner Circle was after at that mental hospital. Turns out, they wanted to break out a young mutant girl, who is allegedly instrumental in Reeva’s plans. Reeva herself doesn’t appear in this episode, leaving the Frost Sisters and Lorna to impotently try to get through to the traumatized girl, who merely lies in bed quietly. Andy however proves to be the one to get the girl to open up, learning that her name is Rebecca, and she has the power to re-arrange the molecular structure of physical objects, essentially allowing her to turn things inside-out. This results in a surprisingly cute ‘date’ between the two, where they deface windows and blow up police cars (so much for being careful! ), and this even culminates in Rebecca impulsively kissing Andy in the elevator! It’s certainly reckless, but these are two teenagers, and it makes sense that a relationship would develop very quickly between two isolated adolescents that constantly feel like they’re alone. Once again, The Gifted is doing a great job in finding the humanity between characters that have such over-the-top powers, and that was also exceptionally displayed in another core storyline shared between Caitlin and John. Reed and Lauren mostly sat out this episode, since Lauren has to recuperate from being injured by Andy during the events at the mental hospital, but this gave Caitlin and John a welcome chance to be the key forces trying to save the lives of the desperate mutants from the mental hospital. John’s guilt over the events in Atlanta continued to bubble to the surface here, as he becomes particularly determined to save a man whose skin and muscle tissue is highly corrosive, making John’s ultra-durable skin the only way that he could possibly be kept alive. Caitlin, meanwhile gets to be the presence trying to keep her head on the mission, providing an inspired counter-balance to John thinking more with his heart than with his brain. The events at the hospital worked twofold as well, since they also allowed Turner to start settling in with the Purifiers, who decide to invade the Mutant Underground’s clinic in an effort to root out and turn in mutants. This provides another tense challenge for Caitlin and John, but more importantly, it goes to show just how Turner is going to fit in with his new friends; Re-tooling the Purifiers to be a less blunt and more tactical organization. This is good in theory, at least beyond the fact that Turner and his Purifier friends are pushing through a clinic, destroying property and beating up human doctors, with no effort to obscure their identities! It kind of defeats the purpose of making the Purifiers smarter when they’re leaving tons of video and forensic evidence all over the place, on top of not even bothering to mask themselves, and Turner, being an ex-cop (hell, wasn’t he brought to the Purifiers in the first place by another cop?! ), should be completely aware that this clinic invasion is the mother of all stupid plans! Granted, the Purifiers’ random violence plan wasn’t any better, and I’m sure that the clinic ideally doesn’t want the police poking around, but if Turner is going to lead the Purifiers into a new era of tactical menace, he should probably start by pointing out that the Purifiers shouldn’t be leaving obvious crime scenes all over the place, especially when they’re making it ridiculously easy to identify them! Regardless, it’s another big loss for the Mutant Underground this week, when Caitlin and John fail to save the dying corrosive man, who sacrifices himself to prevent John from going ape on the Purifiers after they start tossing the hospital like idiots. Not only that, but the actions at the mental hospital have continued to erode the public’s trust in mutants rather aggressively. All throughout the episode, newscasts of mutant protests and anti-mutant violence are spaced throughout proceedings, helping to provide a good sense of scale in terms of just how much the world is threatening to come apart right now. Even Reed and Lauren are helpless to do anything but watch the growing violence unfold throughout the world around them, as the dream of the X-Men continues to come apart even more with each passing day. The current Season Two conflict for The Gifted still seems noticeably slanted towards the Inner Circle, but I guess it wouldn’t make for a satisfying sophomore season if the Mutant Underground started racking up too many victories right away. The remaining subplot with the Morlocks did present an interesting third perspective however, as we get more insight into Erg and how he runs things in the sewers, after Clarice and Marcos are forced to petition shelter for the unharmed and healthier mutants that escaped the mental hospital. This further expands upon Erg having no interest in the war between humans and mutants, and instead simply doing what he can to look after his own community. Seeing him challenge Clarice, rightfully pointing out that the Mutant Underground is built on a naive pipe dream while the Inner Circle just seems like a catalyst for more senseless violence, provides a solid foundation for Clarice’s seemingly inevitable aligning with the Morlocks by the end of the season, particularly when Erg is the one to coin Clarice’s mutant name, “Blink” in this universe. We also get to see Marcos befriend a woman with her own light-based powers here, who was apparently arrested and falsely diagnosed with mental illness after a lone juror refused to convict her for accidentally activating her powers at a concert. The escaped mental hospital patients eventually agree to take the ‘M’ brand on their face and stay with the Morlocks, including this new woman that Marcos has befriended, but it did seem like this story arc was a bit hurried and not always explored to a worthy extent. Still, the asylum in the sewers for the mutant patients could provide a benefit for the Mutant Underground down the line just as easily as it could provide a debt, and at least the Morlocks now have a reasonable excuse to start more actively taking part in this season’s growing conflicts, despite Erg’s neutrality. 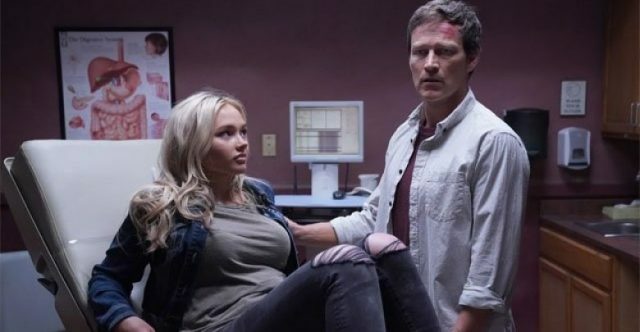 “afterMath” had a lot of ground to cover in the wake of the very high-profile mental hospital breakout, and it certainly felt like yet another very busy episode for The Gifted, but it seems like the show is keeping its ongoing storylines plenty healthy and interesting. The Purifiers still aren’t perfectly fitting in with the show’s mutant war, since they’re still coming off too blunt and reckless, even with Turner supposedly steering them towards more precise and careful planning, but both the Mutant Underground and the Inner Circle nonetheless had plenty of engaging developments this week. Andy’s new relationship coinciding with the Inner Circle’s big secret weapon gives him even more reason to stay entrenched in Reeva’s cause, while both John and Clarice seem to be threatening to drift to highly disparate political stances, given that their separate physical visages are now pulling them towards differing outlooks on the battle for mutantkind. All the while, Fox’s live-action X-Men universe continues to constantly be on the verge of all-out mayhem, as the line between self-preservation and irrational hatred regarding mutants continues to get more blurry for the regular people. This means that there’s still lots of drama and surprises to look forward to though, especially now that the Morlocks are creeping their way into the mutant debate in a nicely subtle fashion. The Gifted presents plenty of exciting and dramatic stakes in the wake of the mental hospital breakout this week, providing engaging storylines for both the Mutant Underground and the Inner Circle.